We are a silver buyer in Mesa, Arizona who gladly accepts silver bars, coins, ingots, jewelry and even any scraps of silver, which you may have laying around the house, and are eager to convert into cash. When you need the highest possible cash payout for your valuables, the silver buyer you should think of first in this area is our silver buyer store in Mesa, Arizona, because we can guarantee you the very best customer service and the highest payouts of any shop in the area. If you’re looking to sell your silver today, there’s only one place to stop. We have in-house experts who are intimately familiar with the global silver market, and who consult the New York spot market prices in order to determine fair market value for all bulk silver that you bring into us. They’ve been exclusively buying precious metals for well over a decade making them true professionals. 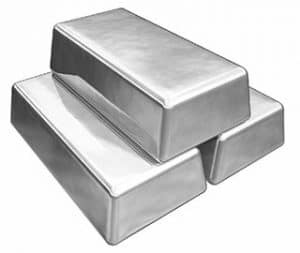 Silver bars stamped with their maker’s name brand, for instance Engelhard, Pan-American, Sunshine, Pamp Suisse, and Johnson Matthey, are all very familiar to our silver experts, and can be tested and weighed right on the spot in your presence. We will be very happy to purchase from you any silver ingots weighing between one ounce and 1,000 ounces of pure silver. Silver coins are also something we are happy to purchase from you including American Silver Eagles, Silver Buffaloes, Canadian Maple Leafs, Morgan Silver Dollars, Peace Dollars, and Australian silver bullion coins. We can also accept American pre-1965 coins which are comprised of 90% silver content, and if you have any question about particular coins in your collection, feel free to bring them into us for an honest assessment and valuation. Once you’ve accepted your cash offer, we’ll send you away with cold, hard cash. Even statues, statuettes, silver jewelry, and in short anything made of silver, is fair game for our silver experts to evaluate and pay you the highest amount for. Sterling silver is our specialty, and we never turn it away! We’ll be glad to talk with you on the phone and give you some kind of estimate of the value of your silver goods, but the most accurate assessment can really only be done in person, so that your silver can be weighed and tested to find their true worth. We buy silver here at our store in Mesa, Arizona, and when you come in to have your collection evaluated, we promise to give you the fairest and most honest assessment of the actual value of your silver collection. If you live somewhere in the region around Mesa, Arizona, for instance a nearby community such as Chandler, Apache Junction, Gilbert or any other close-by town, bring all your silver valuables into our shop, and convert them into cash quickly. If you prefer, you can simply pawn your silver valuables with us and still receive the maximum cash payout, while arranging a three-month loan. Once you’ve paid off both interest and principle on your three-month loan, you can redeem all your silver goods and resume full ownership. Whichever arrangement works best for you is what we will try to accommodate, and in the meantime you’ll have the cash you need to make it past whatever financial hardship you may be going through.